Announcements from the Forum Team. Join our Z900 Photos Gallery. Upload you pics, create albums, and easily embed the images into your posts ! A big WELCOME to all new Members - please post here and introduce yourself! Where are you in the World ? Why not add yourself to our Members Map ! 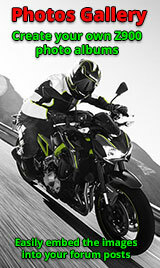 General chat relating to the Kawasaki Z900. Topics in this board must be Z900 related on subjects not covered by other boards. Modded your Z900 ? What changes have you made? What do you want to change? Tell us about what you've done (or want to do) here. Discuss the maintenance and servicing of your Z900. Anything to do with Lights, Wiring, Battery, and Electrics. Also, includes electrical ancillary components. Home of the infamous tyre threads! Discuss your tyre and wheel issues here. Also includes wheel/tyre removal and fitting. Official Recalls and Service Bulletins for the Z900. 2 Wheel DynoWorks are specialists in Dyno Tuning, and offer Mail In ECU Flashing. Custom mail in fork work at an affordable price! Products for your Z900 from Powerbronze. Chat about general bike related topics that do not fit in the other categories. Also discuss other Kawasaki models here. The place for all non-bike related discussions, i.e. general chat, jokes, funnies, sports etc. Get it off ya chest but please keep it clean..! List your your items for sale here - bikes, clothing, accessories, unwanted parts etc. Please do not reply to topics unless you have a genuine interest in the item! After something ? Post your request here and see if someone has what you need. Please do not reply to topics unless you can assist the poster! If you have any problems with the site or have any questions or feedback, post here. Members can use this board to practice their posting skills.